We've been having some fun with our longest stretch of below average temperatures since February 2003 -- 15 days worth of days where the average of the day's high and low is below where we're supposed to be in late July and early August. Given it's summer, such a streak isn't as noticeable...there have been some epic weather wins such as last Sunday and Monday (especially Monday) in this stretch but 4.3 degrees below average, which is the average daily departure over the last 15 days, doesn't quite chill you in August at the same clip as the same departure does in January or February. Where's this "chill" been standing out? In our daily highs. The average high over the past 15 days (excluding today) has been 80.5 degrees, compared to an average of 86.9. Lows have been a bit closer to average, popping in at 66.5 compared to the average of 69.4. In August, it's comfortable. In December, more would likely whine about this...or the lack of snow that would likely follow such a pattern as suppression ruled the jet stream and kept your storm tracks a bit too far south for you snowstarved or snowbirds. And we're not the coolest spot in the country, either. Minneapolis has been relatively cool as well over the past 15 days, averaging 4.3 degrees below average as well. Chicago wrapped up a two week stretch of below average temperatures on Tuesday with a temperature departure of 6.2 degrees from normal. Much of the Midwest, Great Lakes, and Northern Plains also joined Philadelphia in a nice, cool stretch of weather by midsummer standards...with many towns running five or more degrees colder than average. 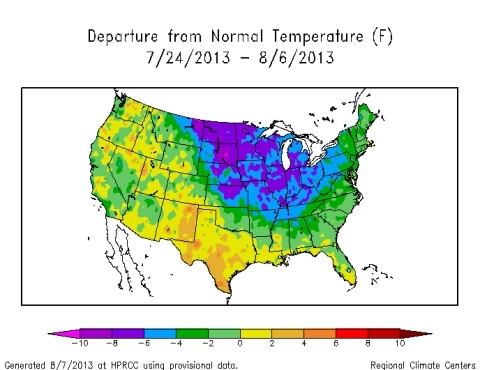 Much of the nation has had a nice break in the heat (Texas and New Mexico two noted exceptions). 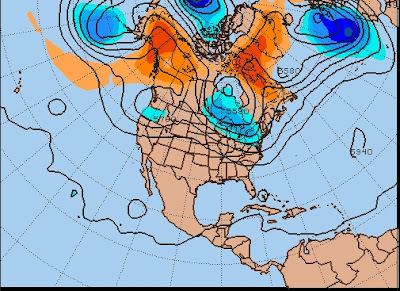 The pattern for much of the past two weeks has been pretty similar to what's depicted above -- trough in the Great Lakes and Ontario, providing us a nice respite from heat and humidity. 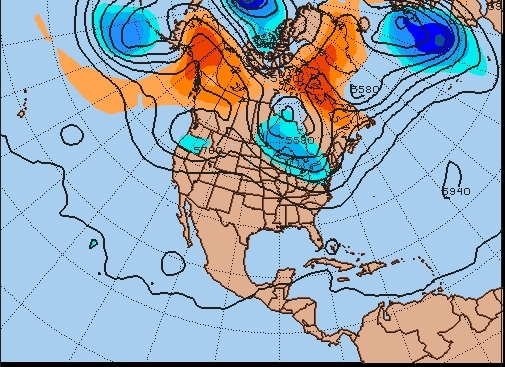 Warmth generally shoved to Texas and the significant warmth (at least to average) set up across Northern Canada. While our stretch of comfortable has ended...at least know we weren't alone in enjoying it as a decent chunk of real estate was also in the midst of summer "chill" the past two weeks.